Exploitation or Salvation? The jury’s still out on this one… | "MASTERS"
Posted on November 13, 2015 by Mark and Sarah - MASTERS! MARK: Bump bump, bumpity bump. Close to seven hours in the back of our Laos mini-van. Windows wobbling, stomachs shaking, scenery stunning. 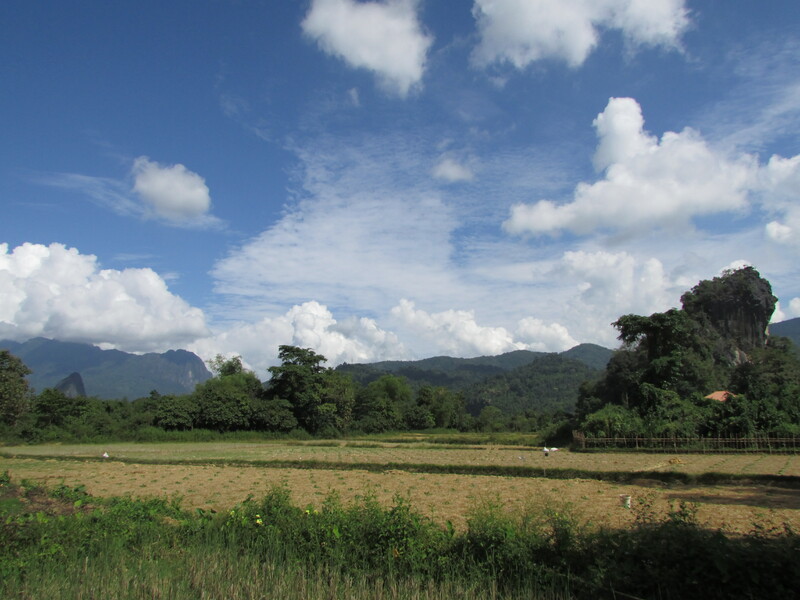 We’d completed nearly 300km, through beautiful mountainous countryside. The “highway” was a winding road, full of potholes. Members of the group were feeling distinctly ill as motion sickness threated. But this marathon journey did have an upside. 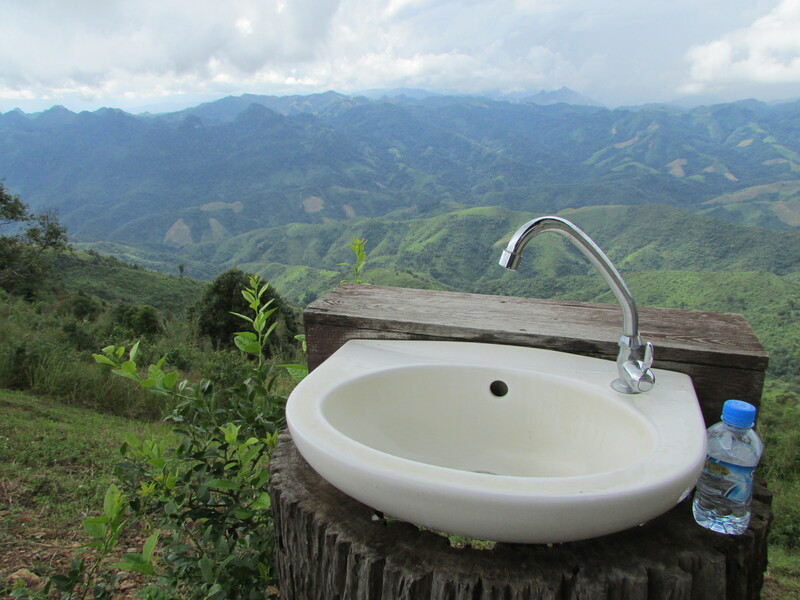 The view from the toilet at the lunch stop was superb and arguably had the most picturesque location for a washbasin anywhere in the World. Appropriate captions welcomed! Washroom to remember – can you think of a better caption? At 4.35pm, a 5km sign for the village of Ban Na Douang came in to view and the road to our overnight homestay suddenly got a whole lot worse, as tarmac was replaced by mud. Chickens, pigs and dogs wandered everywhere, chased by young children. With a jolt the van finally stopped, the door opened and our air conditioned bubble was quickly burst by a wave of steamy heat. The temperature outside close to 35C. I didn’t know what to expect. 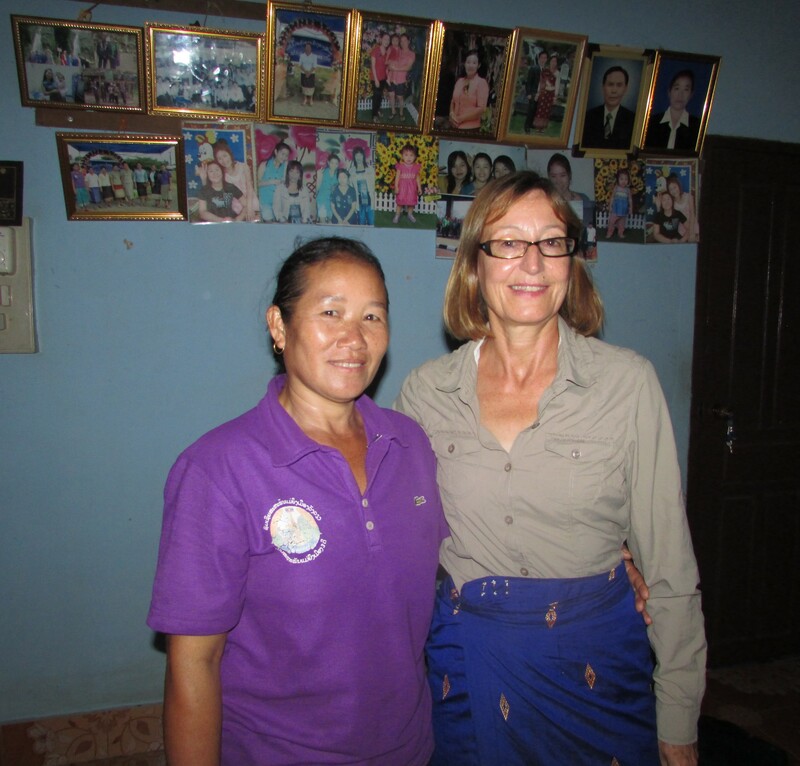 Sarah and I, together with the rest of the group were staying overnight with Laos families to experience “life with the locals”. But I’d read media reports in the past of how this sort of exercise can be staged managed by Tour Companies. 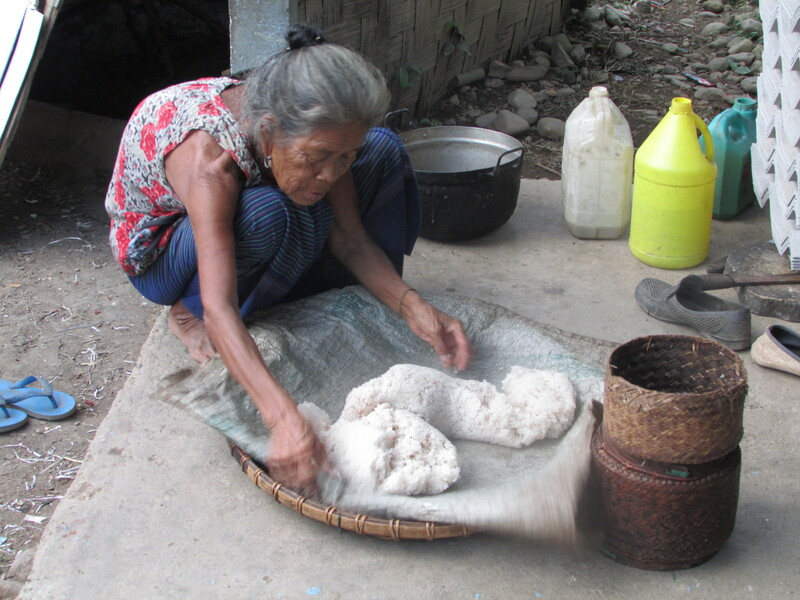 How local people were often exploited with somebody, somewhere making a lot of money. So straight away my cynical head was on as we were introduced to our host for the night – a middle aged “smiley” lady called Song Ting, who spoke no English. 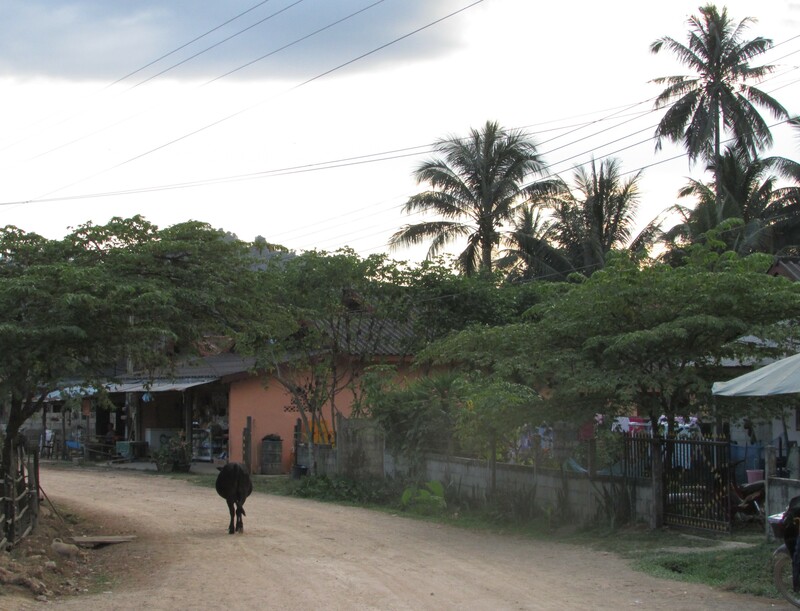 We trotted off behind her to our homestay, a short 5 minute walk along the dusty main street. A large, tiled communal room greeted us. In one corner a couple of seats positioned in front of a large, old fashioned TV – their son, adorned with a football shirt from some minor German Division III League side, watching what appeared to be an American movie. 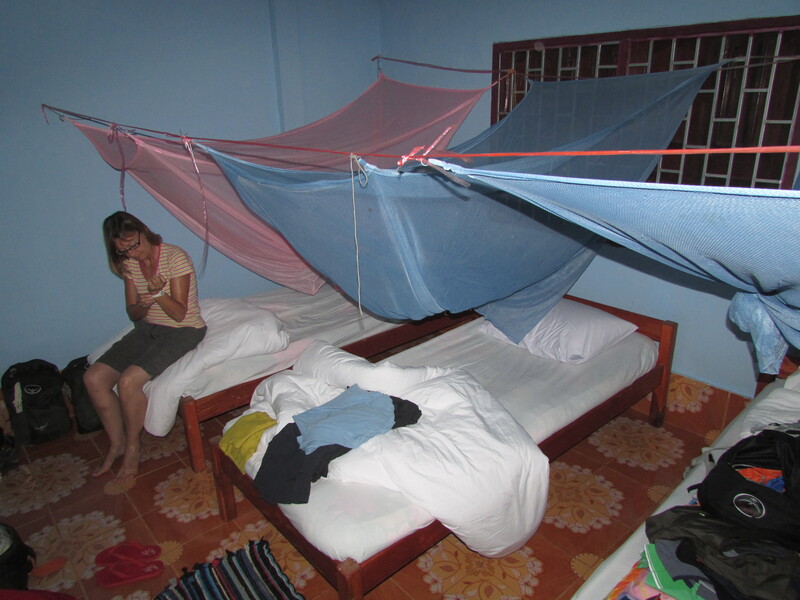 Our bedroom was in the corner, the door creaked open and inside three single beds, each with mosquito net, together with a wardrobe, a fan and a single light. The Ritz it was not. Through the small 3 foot barred glassless window, a small fire could be seen. Next door neighbours were having a bonfire and our room was directly down-wind. The kids started waving and smiling. The smoke now a minor inconvenience. Next door neighbours – if I had Phil Whitby’s air gun, the rooster would be no more! 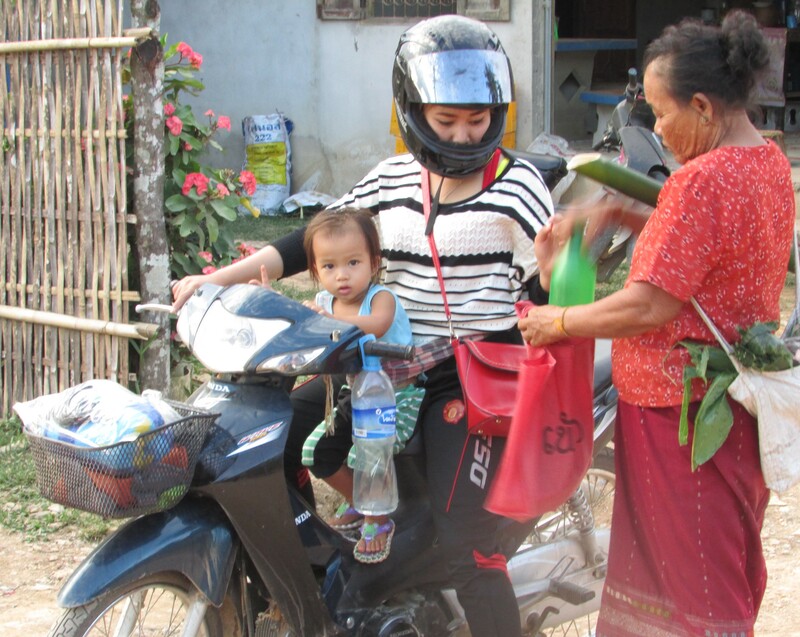 Further investigation of the house revealed a motorbike parked in one room, a few further doors we could not see behind and a bathroom consisting of a non-flush western style toilet and a small shower that pumped out cold water – this better than most houses. We unpacked quickly and headed back to the Village Chief’s house, ready to undertake a walk around the village. Before we started, I had a quick word with a couple of people from the Laos National Tourist Board who happened to be “in town” conducting a reccie, prior to a major Travel Writer/Travel Journalist familiarisation trip the next day. 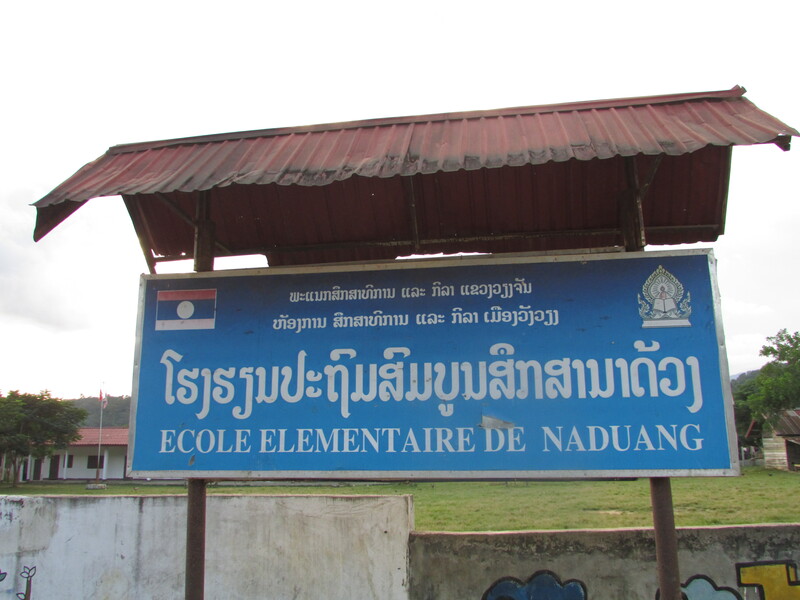 I was told by one official that this was a “model homestay project” in Laos and they were hoping for positive international press coverage. A village walk for our group started as the sun began to set. Sweat dripped down the inside of our shirts. 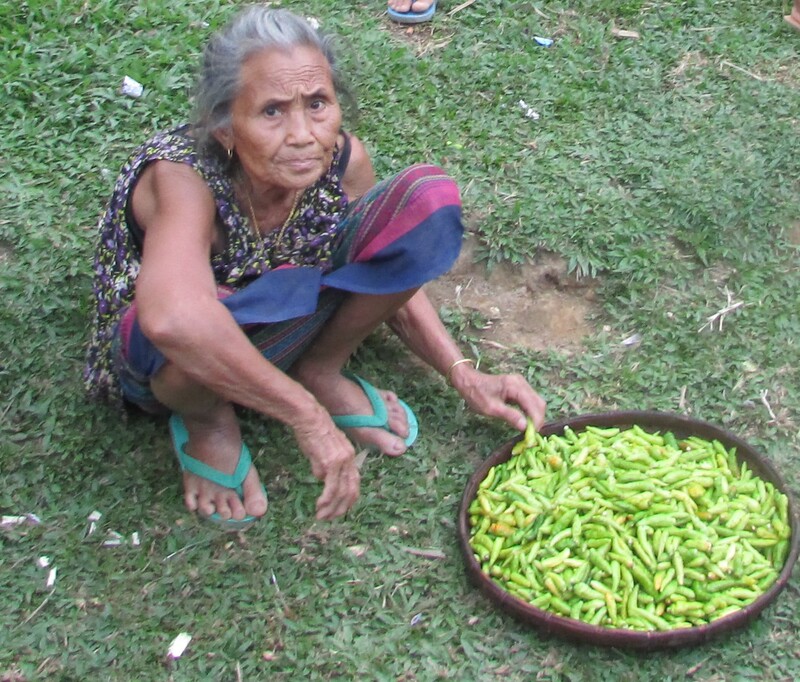 We came across a lady aged 96 making sticky rice, another woman selling green chilli peppers at $1 a kilo, and kids running around carrying water. Men gazed from the inside of simple wooden and breeze block houses, their white eyes shining through the fading light. Sticky, sticky, very sticky – this lady is 96! Round the corner a group of children aged between 7 and 13 were playing football on the scrubland in front of the school. Time for the “Allstars” to take them on. Brendan a 6ft 4in US basket-ball player in defence, Robbie left back and Chris from Wales playing a central midfield role. Chris Number 2 played at right back, whilst James made a few tasty challenges on a couple of ten year olds. I ran around a lot, ineffectively, before nearly dying of a heart attack. We won 2-1, but it was close, with sport yet again proving to be a universal language. We only played for 15 minutes, but my “Jungle” North Face shirt had turned from light brown to dark brown. You could ring it out, it was that wet from sweat. Even a large bottle of Laos beer failed to quench my thirst as we headed off for dinner in a large room. This just did not seem right. We ate by ourselves, no locals in sight. Not what I had bargained for as I looked up and saw a poster of what appeared to be the Laos Communist Party, hanging on the wall by two bits of yellowing Sellotape. The meal was simple but pleasant as the sound of children playing outside could clearly be heard. The decibel level increased and as soon as we had finished, just before 7.45pm we headed out of the communal room, to an area of grass where over 100 children were running around. They were here to dance, show us how to dance and then dance with us. Everything from traditional local music to Gangnam Style. We all took part, the kids loved it, their Mothers (only one man) looking on. After about 45 minutes we were shattered and soaked, the mosquitos having a field day biting my sweaty calves. The kids then quietly made a circle and we handed out books and pens – a small gesture to the village of our gratitude for their hospitality. It was time for bed as the villagers, we were told, were often up and about at 5.00am, so we made our way back to our homestay, opened the front door only to be greeted by a man wearing greeny coloured underpants (and not much else) reclining on the couch. Sarah beat a hasty retreat to our bedroom and safety, jumping underneath her mossy net. Lights out. Next morning the rooster woke us up every hour from about 2.00am, there was something seriously wrong with his alarm clock. At 6.00am we got up, showered and then said our goodbyes to Song Ting, writing in her Visitors Book before we left. 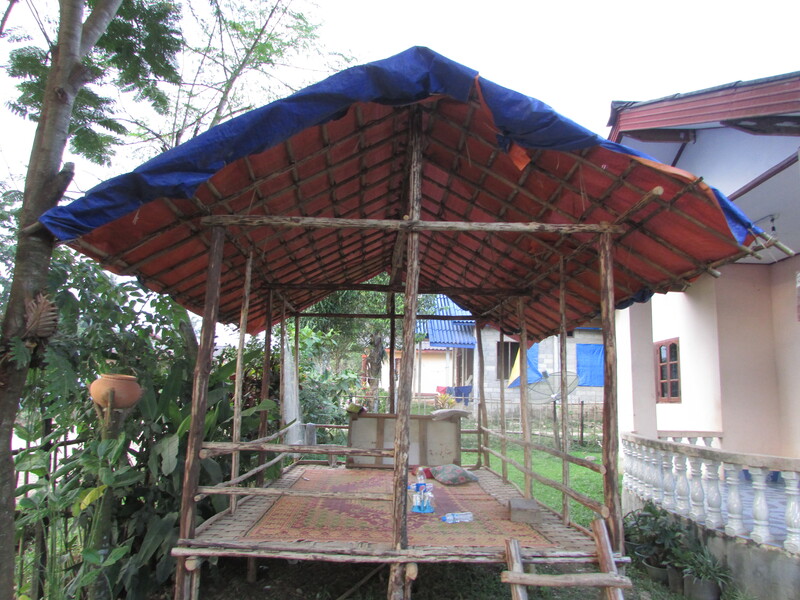 Breakfast was again in the communal room – bread, eggs and coffee – the staple tourist diet in Laos. 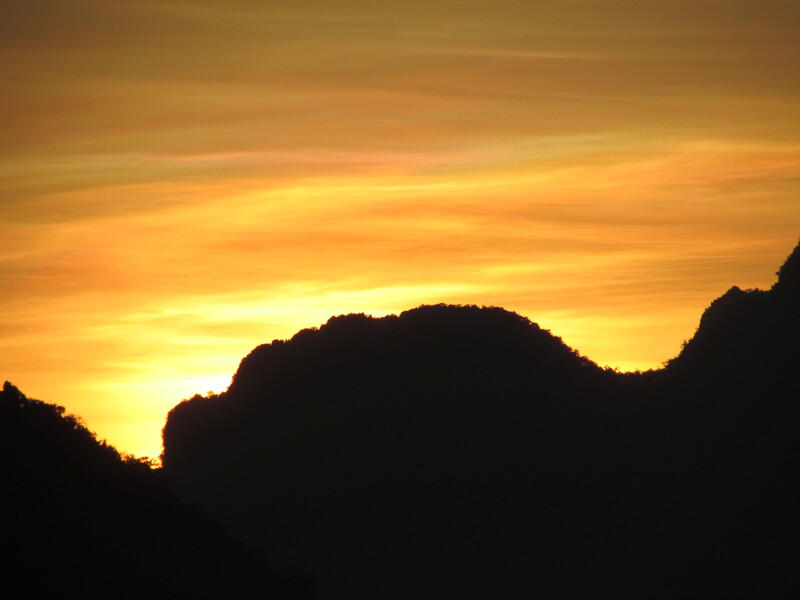 By 7.30am our bags were packed and on the mini-bus for the short transfer in to the town of Vang Vieng our next overnight stay. It was then that various questions came to mind. Why didn’t we eat with the local people in their houses? Why wasn’t there more local interaction with the families? Did the locals mind having tourists around? 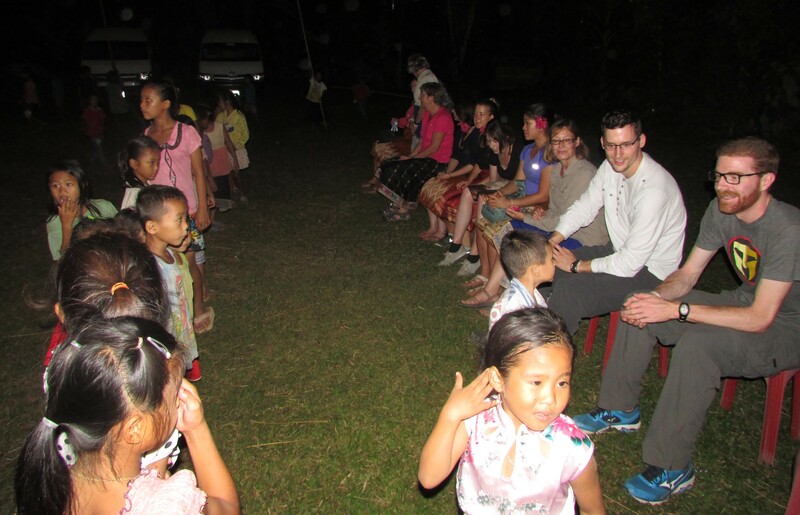 Did the children really enjoy dancing with a lot of sweaty travellers? Were the local people paid a fair amount for our accommodation? Was this just some huge intrusive exercise for the benefit of “experience thirsty” western tourists? Was somebody, somewhere other than the locals making a lot of money? I put these and other questions to our local Guide who went someway to reassuring my concerns. He said it was work in progress regarding increased interaction with families and having the opportunity to eat in smaller groups at individual host accommodation. The locals didn’t mind the tourists as they had seen improvements to their village and increased income which they were very happy with, bearing in mind that field workers only earn $2/3 a day! The children liked the tourists and were particularly keen to play with smart phones and tablets! He went on to say that there was open dialogue between the Village Chief and the local company who had set up the homestay programme, which in turn was contracted by our tour operator. This was open and positive and had created a waiting list of local house owners wanting to be part of the Homestay Programme, although they were only going to increase the number to 12 (from 10) to safeguard getting too big. But, as I write this blog on another bumpy, noisy bus heading to the capital of Laos – Vientiane – the jury is still out as far as I am concerned. Time will tell. 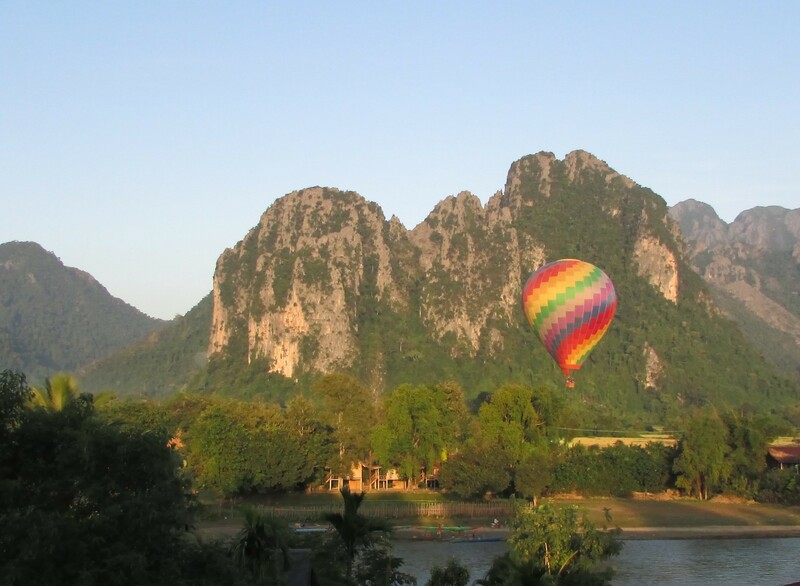 In the meantime, as we leave today for Hanoi (Vietnam), Laos has to go down as the most picturesque and beautiful country we have ever visited. So we leave you on a positive note and some postcard images. Do consider going soon if you want to see Laos in all its finery before being overrun by tourists. 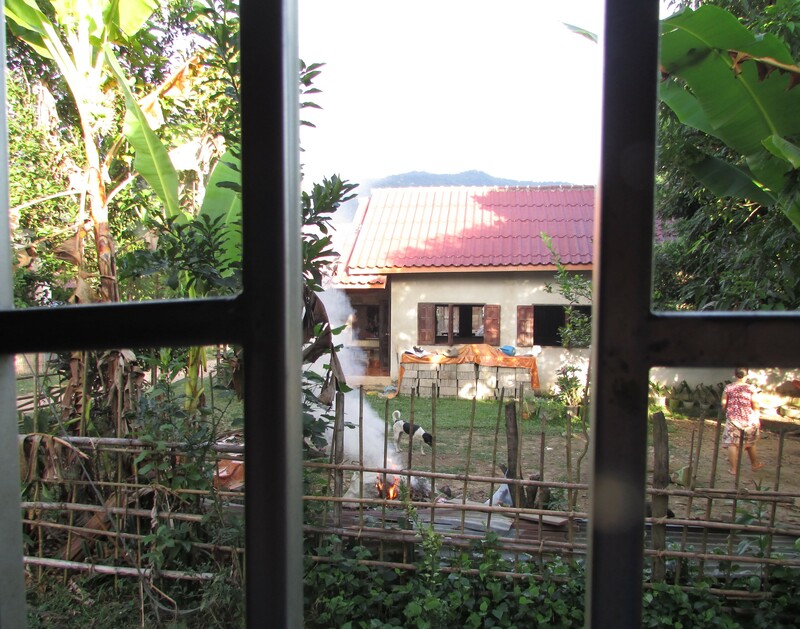 As for the Homestay project, well I need to check back again in a couple of years. The Jury is still out! Pingback: Saved from death by bush – Sarah rocks and then rolls | "MASTERS"
Ps Saw this quote the other day and thought of you ………..I’VE TRAVELLED ENOUGH, said no one ever! I thought it was very lovely. Hi team. Well laos seems to have got you well and truly back into the swing of things. The pics are amazing,keep them coming. It is so difficult to know if the local people will benefit form tourism and interaction from travellers. The world is such a small place to us but these people have probably never left their home town/village etc. (massive assumption I know) I wonder what they really think of it all. I wonder what ultimately it will achieve for them? Like you say Mark, only time will tell. I expect you have heard about the slaughter of 128 people in Paris. A truly horrendous thing to have happened. What must go on in the minds of these people that they think this is the right thing to do. Sorry to end on this note but it has affected everyone here so much. With all the pot holes, it must have felt like home…!!! As Ian says, another wonderful thought-provoking post. What has struck me is some of the words, usually very subjective, that we often use to describe the situation of ‘ poorer’ people, such as exploitation, unfair, inequality, poverty, etc. Many, if not all, of these words generally have negative connatations. I am left asking the question: With the inherent subjective nature of these words, how should one assess the nature of these conditions? Just how negative are they? I believe the only real measure of the quality of our lives is happiness. We know there are a lot of ‘wealthy’ people who are unhappy. In your travels you appear to have met a lot of happy ‘poor’ people. In my humble travels I have not only been struck by the happiness of many ‘poor’ people but also by their generousity, both materially and spiritually. Are we right to seek to increase the quality ( happiness) of the lives of ‘poorer, people by bringing tourism (money and increased awareness) into their lives? I am not calling into question the efficacy of your wonderful odyssey for one moment…it’s just that your wonderful posts are provoking a lot of thought. This appears to confirm one of my long held beliefs that ignorance is bliss…and I should know! 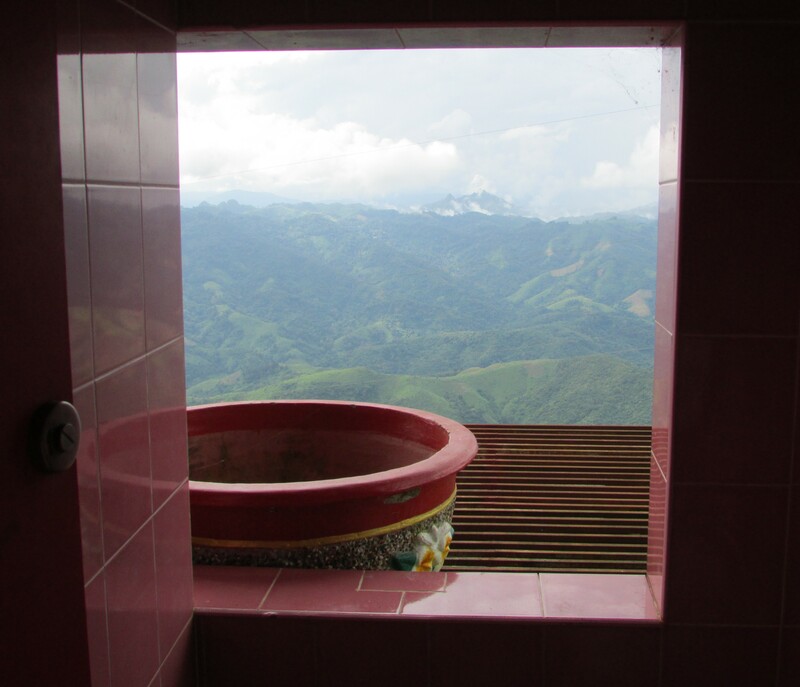 How about, “Hot and cold running scenery, in all bathrooms.” I know it was only cold but a bit of artistic licence, eh? Still trying to work out how, just how on May 10th you come back down to earth. I guess write the book and then go off on the same trip again and see exactly how much things have changed in the twelve months since your absence. That’s a funny look on your face Sarah. 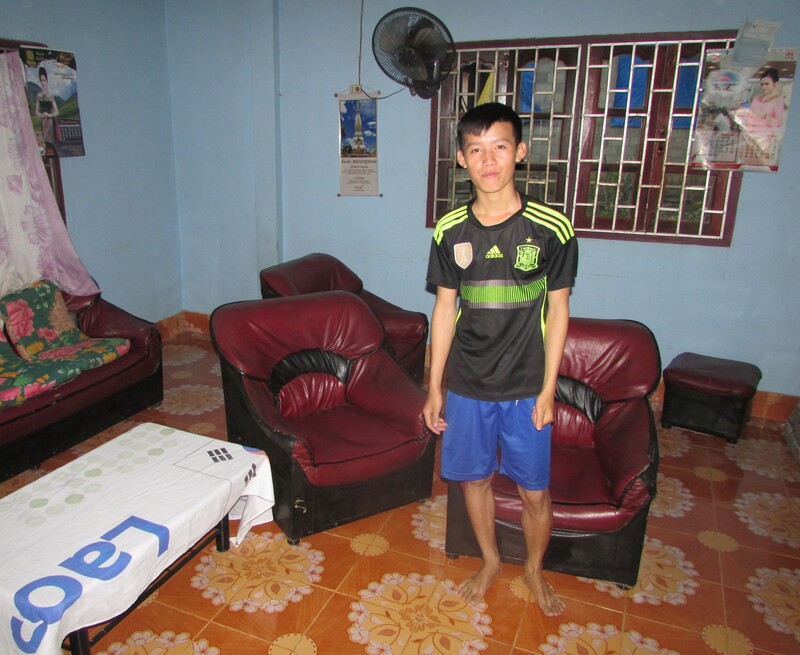 Lovely photos and blog…did you visit hocimean city (I think called Saigon.. If my memory serves me right) along your travels?